From the Service Park… Hyundai NZ Raglan Rally of the Coast, Round 6 of the Brian Green Property Group New Zealand Rally Championship. The TAB has opted to run a book on Hayden Paddon’s next co-driver after the 11th hour swap to Malcom Read in Raglan. The next instalment of Co-driver Survivor should be compulsory viewing but rumour has it Dylan Turner is worried his partner might win. The 2018 Brian Green Property Group New Zealand Rally Championship winner will drive for M-Sport next season in some sort of loan arrangement. Paddon will secure a new deal with Hyundai for 2019 but it will involve more WRC rallies than this season. Paddon is being touted as the potential replacement for Brendon Hartley at Toro Rosso in 2019. The Warriors NRL side have announced they are not interested in signing Hayden Paddon for the 2019 season. Brynley Smith claimed the bragging rights in the inter-team battle and will carry the Mo Bro 1 number plate into 2019. Smith produced a terrific drive to finish eighth overall and out-shine Matt Adams on his debut in the Gull Rally Challenge 4WD class. Which driver in the Brian Green Property Group NZ Rally Championship has a new nickname written on his car’s window? Hint: His dad is a pretty handy peddler and the nickname involves eating his favourite delicacy. Which New Zealand Historic trophy had a close encounter with a rare Waimate worm in the aftermath of Raglan’s prize giving? Our spies have the footage (and it isn’t pretty). Our favourite Scotsman David Taylor will make a jump up in class after an impressive campaign this season. 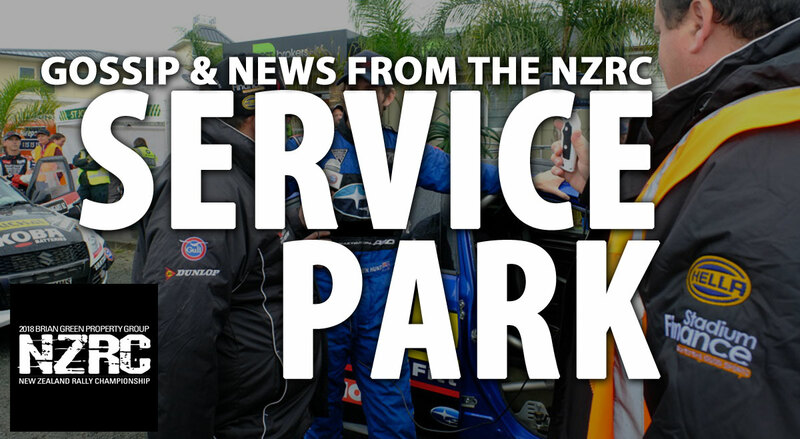 Competing alongside Jared Hudson, the pair took a podium finish in the MotorSport NZ 2WD Championship but will look to enter a 4WD car in 2019. Talk about shooting oneself in the foot – Malcolm Read got the prime opportunity to co-drive for WRC star Hayden Paddon in Raglan. While the pair gelled enough to secure victory, Read had an embarrassing moment after the event when he ‘shot himself in the foot’ when nature called – unfortunately for him it was right in front of a group of NZRC team members only too eager to re-tell the story. Our Japanese visitors can’t be criticised for not being committed. Kimito Kondo and Isao Kono loved the Hyundai NZ Raglan Rally of the Coast but got caught in a spin on the live stream. Live stream commentator Simon Bell explained Kondo’s spin on Te Hutewai from 2017 as the Suzuki Swift approached the corner they were broadcasting from. He asked what chance there would be of a repeat literally just before Kondo produced a carbon copy spin from 12 months earlier. Which recently retired NZRC competitor is thinking about starting a tour group to rallies next year? Punters that joined wouldn’t be short of commentary. Geof Argyle featured prominently at the end of season awards and therefore made a real effort to dress up for the occasion. It started off alright with his ‘dress’ stubbies but unfortunately for Geof he couldn’t find his ‘going out’ jandals. The winners of the MotorSport NZ 2WD championship Dylan Thomson and Amy Hudson will move up to category 1 next season. Grant Blackberry and Ric Chalmers, who won the Gull Rally Challenge are hoping to enter some category 1 events in 2019 while Stadium Finance Group A Challenge winners Matt Adams will also move up to the Gull Rally Challenge next year. Even besties Regan Ross and Marcus van Klink were overheard at the prize giving talking about rallying 4WD cars next year as well. Who had a tanty of epic proportions at Raglan? Hint: They didn’t get far into the event when a mechanical failure ended their day. The competitor was not a happy camper according to our spies. Which NZRC driver is still looking at a move overseas in 2019? Budget could determine whether they can follow in David Holder’s footsteps and enter the Junior WRC Championship but the intent is there. Watch this space. Who is the Tom Cruise of the NZRC? Hint: Short, sunnies, the hair, the swagger, oh and he drives an Audi. But speaking of Tom Cruise – why are two prominent NZRC drivers nominating Top Gun as their favourite movie all of a sudden?